Thunderbolts Forum • View topic - Dowsing and the lattice. Re: Dowsing and the lattice. kevin wrote: I would ask if I may offer a slightly different interpretation of past recorded events. I am a dowser, I posted on this site previously and ran into a lot of flack. I in no way want to cause any upset or cause annoyance. Because of what I detect through dowsing, I view things also from the perspective of what I detect. The conclusions of my dowsing are that eveything is indeed electrically based, but not as commonly accepted. That we are a consequence of the condition upon the surface of this planet, and that condition is variable due to both field interactions of mass and transfers upon a lattice structure of space that is variable relative to position of multitude of masses within that lattice structure. That everything is in a sea of aether, where mass is a consequence of the aether coalescing upon the points of a lattice, and that mass is merely a condition of the field about itself as it forms on that lattice. Many of the ancient symbols and depictions I view, i do so with my dowsing findings on board. I can dowse all things, we and everything has field structure that interacts with all other fields, all in a sea of aether. I find dual spin evident flowing upon the lattice work, the lattice has measure, and that measure and the patterns formed I find illustrated in most parts of the worlds ancient cultures. The measure of fibonnaci is central to the lattice, that lattice never ever moves, what flows upon it is constantly variable, and the moon gives the best clues as it alters the field balance between the earth and the sun. If any posting containing any of my findings grates at all, i would prefer an honest answer and I will depart, but view your fabulous site with interest. If so, please view this post as a thought to keep in your minds, I can detect with my hands far more than our common senses , and again many ancient symbols and drawings show what is available by this detection method, i know because I recognise them. I have trawled the ancient megalithic world checking what I detect, i have haunted the norman churches and cathedrals, noting every symbol and carving and checking its relevance to my dowsing, I know the measure of it all. All of the religious symbols are found within the lattice structure, and as the whole structure has symmetry each differing symbol raises in prominence at differing points, always a four way cross with circulations about it is evident. The lattice is composed of dead straight lines, they occur in nine parallel lines grouped in three sets of threes, which can all be found left as stories. The point where numerous numbers of these sets of lines cross ( always in numbers matching fibonnaci sequence ) the stunning geometry formed is shown in all cultures , the spirals leading into and out of the central point are pathways where what you call plasma jumps from line to line leading into points of least resistance, and back out again, neighbouring such points then twine together in DNA fashion and creation occurs. The tree of life depicted everywhere is a representation of where parallel sets of the nine lines run and overlap each other especially on N,S and E,W alignments, fibonnaci spirals eather side of each line form as transfers of potential occur, this occurance is where all the churchs and cathedrals and ancient sites were sited by those who must have been able to sense as i do, or actually see this happening, the seeing part is assisted in the cathedrals by the coloured glass and incenses poured into the chambers, i have watched. I do not think of plasma anymore or use the word, it confuses the issue, it is all alive, we are a consequence of it, we come from it and return into it, everything is one, and that one has a dual nature that is created by geometrical brilliance that turns the spin into its opposite and they are then attracted together. Thank You both for Your words of encouragement. I do need to add to this thread. Or like a human form, a friend with whom he lived benevolent. I will try to better explain some of the above as to how all is one, but has scalar consequences, but if You percieve any scale of it, You can then comprehend all. That the electrical force in universe acts in spiral dual spin manner relative to the very complex geometry of a fixed aether structure, and that all We think of as solid , is in reality held within it's own local memory field in vortex fields that have polarity and equator. kevin wrote: Viscount aero, and cat. Wow that's awesome, thank you Blake is one of my favorites. Blake is one of My favorites also, and I am biased , as I share the same birth date. Perhaps We came from galatic centre( Ophiuchus) the 13th sign, My uncle fibonacci, and the vedic scriptures knew of this number. To think of a point, and how spiral pathways lead into and out of that location is difficult, unless You view a pine cone, then You will note the geometry thatcreates a local vortex which is heart centred. You viscount aero are such, not to Your dominant physical senses, but to such as those I utilise which is the memory field I exist within. What I offer is that which I detect, and by the number of megalithic constructions and later such as Norman churchs, I follow in many footsteps who have also been able to utilise such, but now in this age of information I am able to convey what they were surpressed from doing so? Kevin, your point of view and style is very excellent and fresh. I like your philosophical science style and world view. It mirrors very much my own. Blake was also a painter, an amazing one. I feel a kindredship with him. I walked into an exhibition of Blakes works in Sheffield, and was transfixed by His River of life pastel. I understood many things . Ever wanted to be in more than one place at a time? 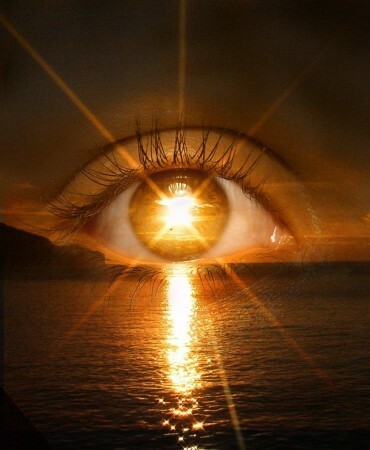 That’s right, I’m talking about the super-human abilities that can be gained by those who follow the protocol for what’s known as sun-gazing, a valid practice recently confirmed by NASA. Many proponents of this ancient technique, used by many cultures such as Mayan, Egyptian, Aztec, Tibetian and Indian yoga, report not only healing benefits to common illnesses, but obtaining super-human abilities such as advanced telepathy and going completely without the need for food. My model of the Sun developed when I was doing just this, about 3 years ago, but not because I had read about it, just as a side effect of meditating while facing the Sun in the late afternoon. The most profound metitation I have ever experienced. There is more to the Sun than meets the eye? Very well stated! Thank you for posting! If it turns out that I am not MAD after all???? where will I then post? Hi Kevin. Of course you are not "crazy". I am sensitive to auras and the earth's chi. I guess 90% of all people of the world are sensitive to some kind of Chi. I am capable of Dowsing, because I feel the differences in the earth's chi. I don't use rods though. I'm too skeptical for that. Would highly recommend reading through the pages of this link, especially if the link to ancient rock carvings interests You. My dowsing is related to this link. I need to watch them a couple of times, but He said something very familiar to Myself about how the patterns effect oneself. I started drawing all of this out by hand on a drawing board, and began to recognise them , hard to explain this. The flows of consciousness are detectable in full reversal.